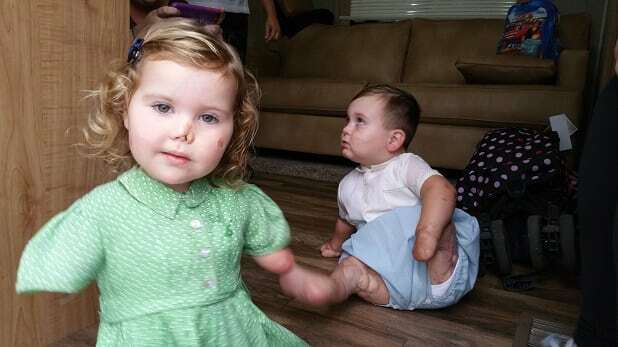 This is the heartwarming moment a toddler who lost all her limbs to meningitis takes her first steps with a new walker. Brave Harmonie-Rose Allen, three, was struck down with a deadly strain of meningococcal septicaemia at just ten months old. She was rushed to hospital where doctors told parents Freya Hall, 22, and Ross Allen, 24, that she had a ten per cent chance of survival. Miraculously, brave Harmonie-Rose defied the odds and beat the killer bug – but lost her arms, legs and the tip of the nose in the process. Harmonie-Rose’s mum, Freya Hall, shared a video on Facebook of her “invincible” toddler taking steps with the walker. She shared it with the message: “She sure knows how to make a sad day ALOT better, today she had her first booster session with physio and she started to take steps with a walker!